At least 66 people are dead after a ferry carrying more than a hundred passengers capsized on the Padma River near the Bangladesh capital of Dhaka, according to police and local officials. "The ferry capsized as it was hit by a cargo vessel," regional police official Bidhan Tripura told Reuters. He added that police had seized the trawler and arrested two of its crew. The accident happened at the Daulatdia-Paturia crossing on the Padma River, 40 kilometers (25 miles) northwest of the capital Dhaka, according to fire department official, Shahzadi Begum, cited by AP. The ferry was submerged at a depth of up to 20 feet (6 meters). "The ferry was recovered ... and there were 23 bodies inside,"regional police official Harun-ur Rashid told Reuters. "There might be more bodies trapped inside the ferry and searching is continuing." At least 43 bodies were recovered earlier on Sunday. According to police, 50 ferry passengers were rescued. Up to 150 passengers could have been onboard the twin-deck MV Mostofa ferry when it capsized, according to survivors, as reported by Australian Associated Press. Ferries in Bangladesh don’t have lists with passenger names, so it’s hard to estimate the number of those missing. A surviving passenger said many people were trapped inside as the ferry sank. "The passengers who were on the deck have survived, but many who were inside got trapped," Hafizur Rahman Sheikh was quoted as saying by the Prothom Alo newspaper. Overcrowding and poor safety standards are often the cause of ferry disasters in povery-stricken areas of southeast Asia. 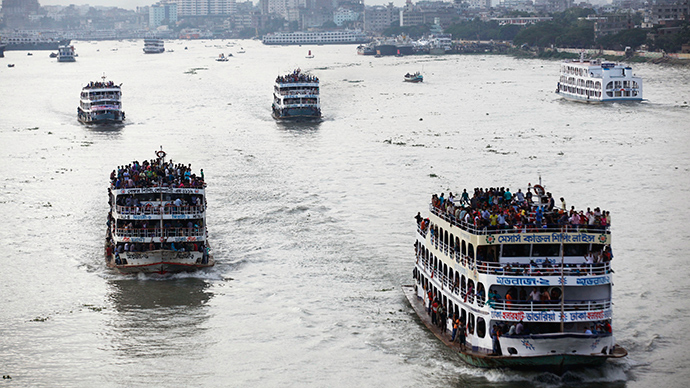 Another ferry capsized in Bangladesh just a week ago, killing at least seven passengers. Last August, a ferry with a capacity of 85 passengers was carrying more than 200 when it capsized, also on the Padma near Dhaka. More than 100 people died or went missing in that accident.